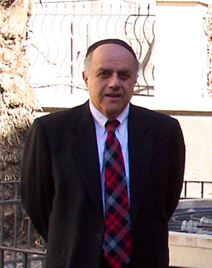 After months of preparation, Carmen Weinstein, the president of the JCC (Jewish Community Council of Egypt) launched a legal counter-attack to regain the Egyptian Jewish properties in "Haret El Yahud" last week. Ms. Weinstein after preparing all the documents that proves that the buildings in dispute is owned by the Egyptian Jewish Community took the matter to Cairo court and presented her case with supporting documents showing that the JCC is the lawful owner of the buildings in "Haret El Yahud" currently occupied by tenants claiming that they bought it from some Egyptian Jews before they left Egypt in 1967. In court Ms. Weinstein and her attorney presented her case and provided the judge with ownership documents. The Tenants or alleged current owners did not have any documents to prove their ownership. Apparently they just occupied vacant apartments after the Egyptian Jewish families who lived in it immigrated. The court issued a final ruling in favor of the JCC stating that the JCC is the lawful owner of the four buildings in dispute in "Haret El Yahud". Ms. Weinstein, the wise lady knew that getting a ruling in her favor is one thing and being able to enforce the ruling is another thing, requested and was able to secure a police force to accompany her to regain the property. The current occupiers of the four buildings seeing that they lost in court wanted to repaint the case as a political case and called Al-Jazeera TV to complain about the JCC is trying to take their apartments and throw them in the streets. Al-Jazeera seeing that there might be an interesting story behind that called the JCC and requested an interview with Carmen Weinstein and her comments on the claims made by the current building tenants. The wise Carmen Weinstein knew that Al-Jazeera was only setting her up and wanted to make a story of it, turned their request down. For the people who are boycotting the JCC and Carmen Weinstein, here is a message for you. For the people who are refusing to support and donate money to the JCC in order to preserve our Egyptian Jewish heritage, here is a message for you. For the people who have doubts about the fairness and effectiveness of the �CURRENT� Egyptian Judicial and legal system, here is a message for you. For the people who are in the business of crying over the spilt milk, look at Carmen Weinstein and learn from her. Pessah brings back fond memories when my mother and grandmother with two maids plus a manservant at their beck and call, spent weeks preparing for it: the harosset, at least three different sorts. The white pumpkin jam with mesteka, the coconut jam, the almond little cakes. And as we came closer to the Seder dinner, it was time for preparing the special food which they cooked only for Passover: the kneidlach, the roast leg of lamb, the "hamod" (a special sauce-soup with plenty of lemon and rice meatballs) plus the cooked vegetables. In the forties, before the Battle of Alamein scare, there were many Jewish servicemen of different nationalities stationed in Cairo. There was even a Jewish Welfare Club situated on the first floor of a building across the street from Shaar Hashamayim Synagogue on Adly Street. I feel it incumbent here to mention that I never knew the name of this synagogue except towards the eighties� that is 40 years later. To us it was always the Ismailia synagogue or the Adly synagogue. 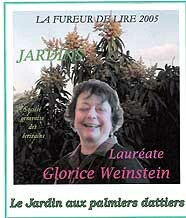 My mother worked as a volunteer in the club with many other Jewish ladies. They took it in turns to serve the soldiers and talk to them; make them feel less homesick being so far away from home in these dreadful times--little did we know that our times, what with the terrorism, traffic problems, the Taxation department etc., would be even more nerve racking. Well, it was in this club that I had my first taste of Coca Cola.  It was sent to the servicemen and when I went to help my mother on her duty night, I was allowed one as a reward. 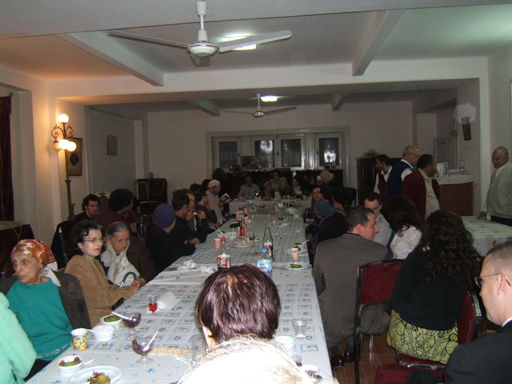 It was customary for the volunteer ladies to invite a number of servicemen to celebrate Pessah in their home. We usually received two who shared Seder with us. We were at least 15 around the table reading the Haggadah, each one reading a part in Hebrew, in French or in English. The prayer lasted hours. I remember one of those who came had the same surname as us "Weinstein". You can imagine the lady's stupor and embarrassment. The story made the rounds of Alexandria community and of course gleefully reached the Cairo one. Well, until 1981, the Cairo Jews celebrated Pessah in their own homes. 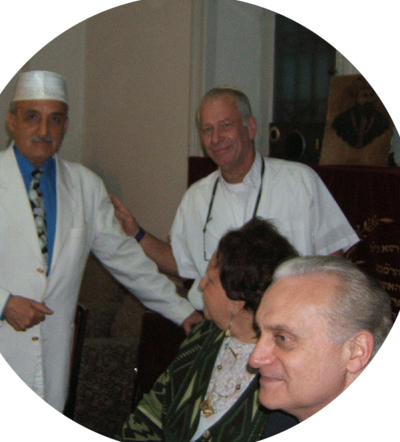 When the Israeli embassy was established in 1980 a new mode of Pessah celebration entered the lives of the remaining Cairo Jews. 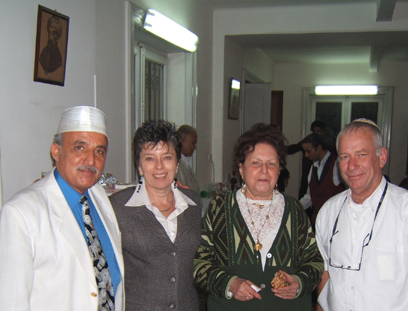 The embassy usually booked a hall in one of the hotels, imported a Rabbi as well as special Kosher food from Israel. The successive Israeli ambassador invited the Community members, Jewish expatriates and any other Jewish tourist or travelers who wished to join. It was quite a boon for us who had been left on our own for so long. However this trend stopped in 2003 for unknown reasons known only to the ambassador of the time!!! But substitute miracles happen. In 2005 I received a phone call from Rabbi Mark El Fassy from Paris, France, who offered to hold a Seder in Adly Synagogue. It was a great success. We received calls from students, tourists, etc who wanted to attend. From that time we've established a new tradition that proved to be quite popular. This year the Seder of 2007 proved to be a special one. We were honored by the presence of the American Ambassador in Egypt, Mr Francis Ricciardoni. I asked him if he would be interested to partake of our Passover celebration. He sent me an email asking "can I bring a friend?" Along came Ambassador Ricciardoni accompanied by John S. Wolf, former US ambassador to Malaysia and president of the Eisenhower Fellowships who told me he had just rang his wife in the US to tell her how excited he was to celebrate Pessah in Egypt. Also from the American Embassy came Roger Kenna, a long standing acquaintance, who said he was thrilled by the Haggada reading. We also had our good friend, former Canadian Ambassador Mr Michel de Salaberie. He too is a staunch friend of Egypt. We had expected about 50 people, but more asked to be included with a total of 70 participants. I follow our old tradition to admit anyone who comes to partake of the Seder. There were of course the members of the Community in Cairo, some American students studying in Egypt and others including tourists and naturally our reliable staff, cooks and waiters. Rabbi El Fassy read the Haggada in Hebrew. The guests who so wished were given translations in French and English. The reading took one hour, with all the rituals of bitter herbs and sweet harosset, matzos with sweet herbs, kiddouch and all the traditional prayers. Mark El Fassy humorously remarked in the end that the Egyptians referred to in the Haggada were idolaters and not to be mistaken or compared with the present Egyptians who are staunch believers in One God. Egypt has for centuries been a land that welcomed people of all religions especially those fleeing persecutions in their native countries. This is why the Exodus of the fifties was a sorrowful event deplored by both sides. We can only pray for peace and tranquility and may God inspire men of goodwill to help the world regain some of its reason. The Seder dinner was claimed by all to be succulent and fortunately it sufficed for all. It is only left for me to hope that we may be able to go on with our Pessah celebration and to find more and more friends around our Seder table. At this point I want to wish a good Passover to all the Jewish communities around the world and a happy Mouled El Nabi (Prophet Mohammed's birthday) to all the Moslem communities. 2007 is also special because Seder-Passover, Mouled al-Nabi and the Easter festivities celebrated by the Christian communities were all within days of each other as though God was sending us a celestial message by gathering all three religious celebrations in one knot. It is up to all men to keep it so. It was in Alexandria in the early 90's that I met Naguib Mahfouz for the second time. The first time was years before when my friend Wendy from LA accompanied me to the great thinker-writers of the day huddled together on the 5th floor of al-Ahram newspaper. They were all there: Ihsan Abdelkoddous,Tewfik el Hakim and Naguib Mahfouz among others. Mahfouz received us cordially in his usual simple way and said humorously "they put us here I don't know why, but here we are!" So that summer afternoon in Alexandria my late and very regretted friend the writer Naim Takla asked me if my sister and I wished to have tea with Naguib Mahfouz. My sister was visiting from Switzerland and couldn't believe her ears that we would actually meet Mahfouz. And off we went with Naim to the San Stefano , which was still standing then. On the large terrace overlooking the sea Mahfouz was surrounded by aspiring young novelists and admirers. He greeted us smilingly and told Naim "Are there still people like these in Egypt?" He must have found us all dressed up in afternoon apparel in the old Alexandria tradition when society ladies dressed up to have tea by the beach or to play bridge at a friend's seaside home. The young men around Mahfouz were apparently trying their hand at creative writing and each in turn read out something he had authored. Mahfouz would give his opinion, criticize or praise. When most of them left and only one or two friends remained he turned to my sister and asked her what she did in Switzerland. "I'm a doctor in psychology specializing in children and young adults." 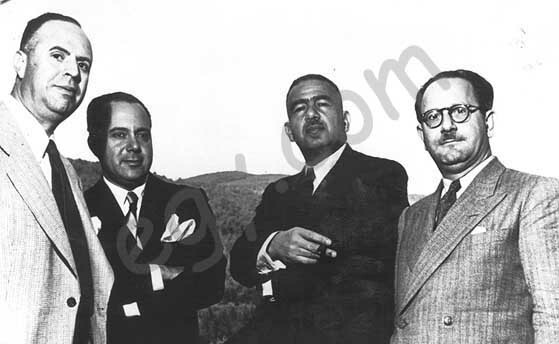 Mahfouz unexpectedly commented "And did you study with Doctor Piaget?" "Yes" she answered, "in fact he tutored my thesis." My sister was quite surprised that Mahfouz knew Piaget since only students of psychology were familiar with him. But such was Mahfouz full of surprises for he apparently was interested in all domains besides his own. We drank our tea and chatted with the great man while Naim took some photos. As more people arrived we left wishing him more and more success and a long life. Memories remain even as people we knew and appreciated depart from this world. First to go was Naim Takla who died quite young and now Naguib Mahfouz. The best obituary written about him by far is Anis Mansour's: "Naguib Mahfouz had a birth certificate but no burial permit." As all great writers he will live forever through his books and in the memory of those who met him. 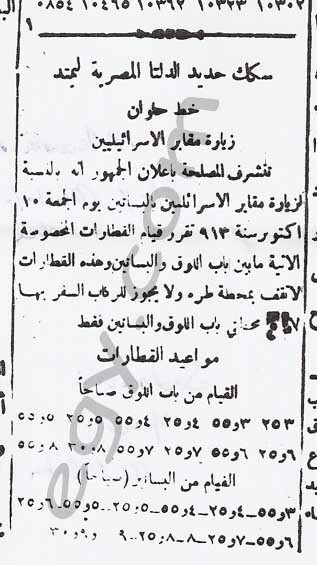 An advertisement on 4 October 1913 in al-Ahram newspaper announcing that the Egyptian Delta Railways Ltd. is providing a special train service from Bab al-Louk to Bassatine Cemetery via Torah Station on the occasion of the High Holiday on Friday October 10. The schedule lists eight return trips. 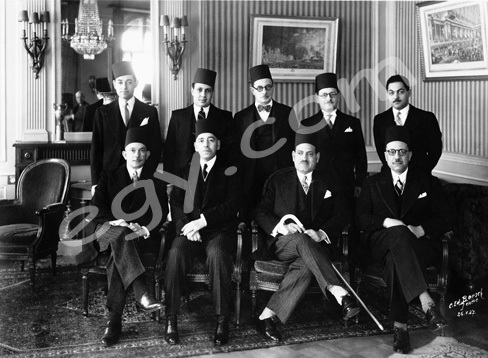 A photo representing the kaleidoscope that was Egypt in May 1937; the bipartisan multi-ethnic Egyptian delegation to the League of Nations pauses for a photo-op at Geneva's Hotel des Bergues: Seated from L-R: Ali Chamsi Pasha (Muslim), Foreign Minister Wassef Ghali Pasha (Copt), Prime Minister Mustafa Nahas Pasha (Muslim) and Wafd Party elder William Makram-Ebeid Pasha (Copt). Born in Cairo in 1900 and educated at the College des Freres and the Ecole Francaise de Droits, Leon Dichy was the secretary of the National Economic Council as well as State Controller of the Public Debt. and on Saturday 22 September from 8.30 am to 6 pm. and Happy New Year "Rosh Hashanah."